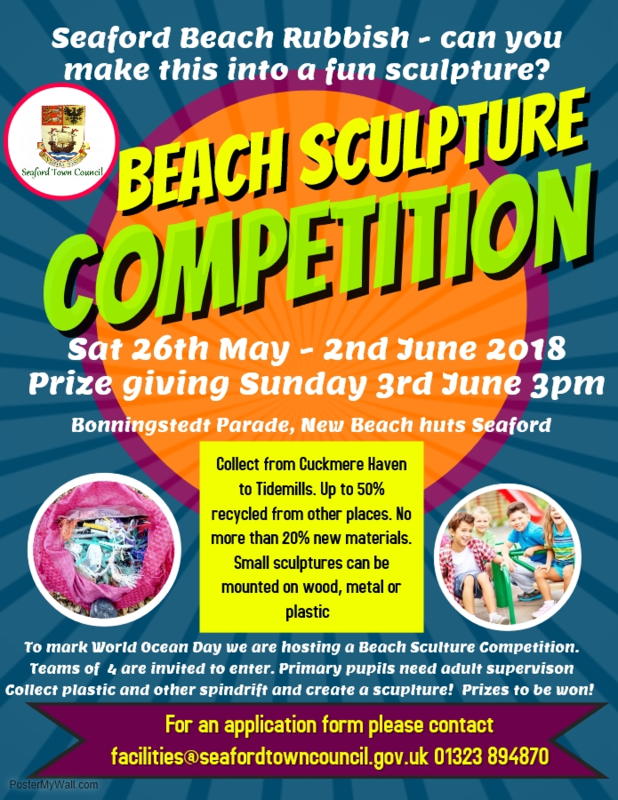 To mark World Ocean Day 2018, we are hosting a Beach Sculpture Competition which is being led by Cllr Lindsay Freeman. Teams of up to 4 are invited to enter in either a Primary or Secondary age group. Primary children need to be supervised by a responsible adult. Collect plastic and other debris found on the beach from Cuckmere Haven to Tidemills during the week of Saturday 26th May – Saturday 2nd June. Bring your sculpture to the new Beach Huts on Bönningstedt Parade by 2pm on Sunday 3rd June for judging. Prize giving at 3pm. Use up to 50% recycled materials from other places. No more than 20% new materials. Small Sculptures can be mounted on wood, metal or plastic. Get creative and let your imagination go wild! Have fun and good luck!